Advanced materials and composites play a very important role in prospective directions of modern science and technology, defining the quick development of technique and industry. Intense chemical, physical, and mechanical R&D of modern numerical approaches and methods of mathematical modeling are necessary for development and improvement of material properties. These PHENMA 2017 Proceedings are devoted to the development and solution seeking of different actual problems into a framework of the pointed research directions. The book presents new results of internationally recognized scientific teams in the fields of materials science, physics, mechanics, manufacturing techniques and technologies of advanced materials, operating in diapasons from the nanometer level to the macroscopic level. The proposed theoretical and experimental methods are devoted to new approaches and methods for fabrication of nanomaterials, (environmentally-friendly) piezoelectrics, magnetic and other advanced materials and composites. Applications (PHENMA 2017, October 14-16, 2017, Jabalpur, India), http://phenma2017.math.sfedu.ru; http://phenma2017.iiitdmj.ac.in. This book is addressed to students, post-graduate students, scientists and engineers that are studying and developing a new generation of nanomaterials and nanostructures, piezoelectrics and magnetic materials, other promising materials, and also various devices, manufactured on their base and intended for numerous applications in various regions of science, technique and technology. 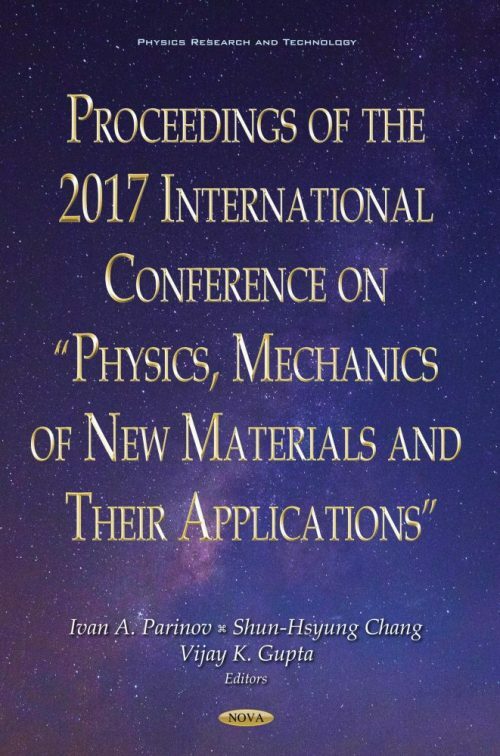 This book presents new investigations and scientific results in condensed matter physics, materials science, physical and mechanical experiments, processing techniques and engineering of nanomaterials, piezoelectrics, ferromagnetics and other advanced materials and composites, numerical methods, and various promising applications (including industrial) and developed devices. Chapter 33. Is Isomorphism in the Binary System Pb1-xBaxTiO3 Possible? Chapter 70. Why Have Ceramic Building Materials Recently Dominated in Interior Design in Surabaya, Indonesia? The book can ground some University special courses in the fields of Condensed Matter Physics, Materials Science, Physical and Mechanical Experiment, Processing Techniques and Engineering of Nanomaterials, Piezoelectrics, other Advanced Materials and Composites, Numerical Methods and also different applications, developed devices and products. Researchers, engineers, students, post-graduate students and their teachers, scientists and engineers, taking part in R&D of nanomaterials and structures, piezoelectrics and ferromagnetics, other advanced materials and promising devices can discovery many interesting methods, approaches and results, obtained by modern science. The presented processing technologies, materials and applications could be interesting for industries. The presented approaches, methods and models of management are important for corresponding scientific and educational directions.